Royal palaces of the Joseon era (1392-1910) will hold limited tours, with Deoksugung inviting guests to see inside its buildings and Changdeokgung holding its annual nighttime tour. 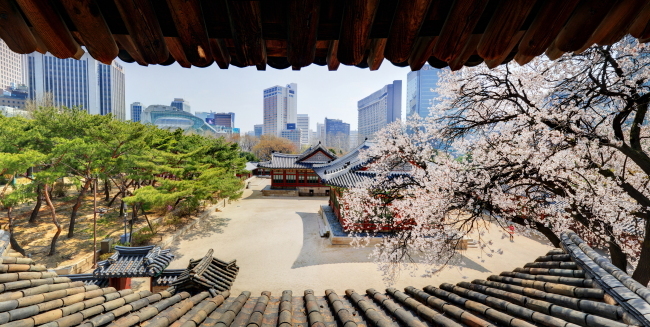 From Wednesday to Sunday, and on April 2, tours of Deoksugung’s five main buildings will be held twice a day from 10 a.m. to 11:20 a.m., and 4 p.m. to 5:20 p.m., according to the Cultural Heritage Administration. Deoksugung was originally built as a home for the royal family, but became a palace after a Japanese invasion in the late 16th century destroyed the royal palaces. It was used as the main palace of the dynasty during Joseon’s dying years, during the reign of its last kings Gojong and Sunjong. The tour will take visitors inside Junghwajeon, the main hall of the palace, Junmyeongdang, where King Gojong would welcome foreign envoys, Jeukjodang, the king’s office, Seokeodang, where King Seonjo stayed after the Japanese invasion destroyed other palaces, and Hamnyeongjeon, where King Gojong took his final breath in 1919. Up to 15 people can attend each tour, with reservations available from 10 a.m. on Tuesday. Only those in middle school or older are permitted, to maintain order within the ancient buildings. Reservations for the tour can be made at the homepage of the Deoksugung Palace Management Office (www.deoksugung.go.kr), which also provides information about the palace in Korean or English. Last week, reservations for the popular nighttime tour of Changdeokgung commenced at Auction Ticket. The tour runs from April 4 to June 9, and from Aug. 22 to Oct. 27, and tickets cost 30,000 won per person.